It’s seven o’clock and the sun is casting shadows over the stone white buildings clasping to the cliff edge, bringing another day to an end. From our spot by the church, a church as quintessentially Greek I ever did see, we begin the descent, following the cobblestone path back to the main town, Chora. As dusk begins this Cycladic town has come alive with bustling tavernas, local cats as skinny as my wrist, and the sound of live music. The restaurants and bars at the cliff edge are especially enchanting and there’s a rush to win one of the best tables. Just a few miles across the Agean lies Santorini, the most popular of the Cycladic islands, but it’s smaller sister, Folegandros, has much more to offer in many ways. 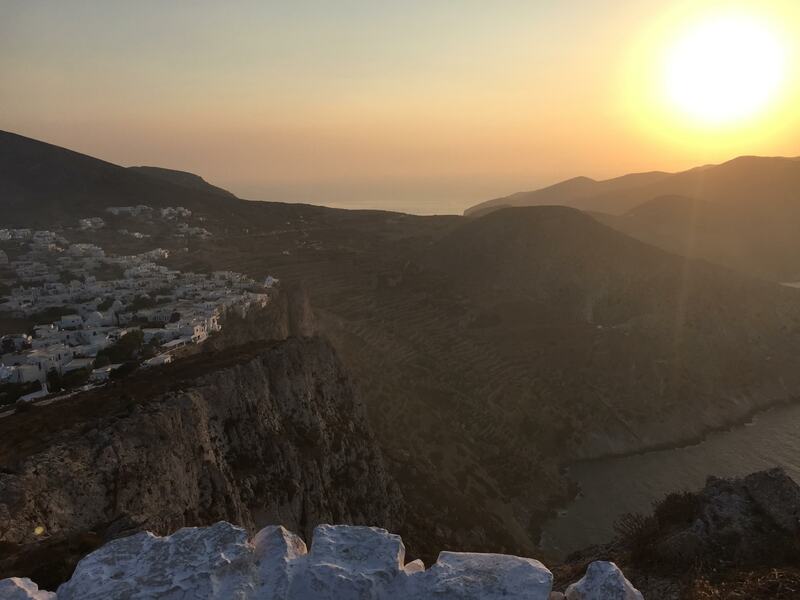 Just 32 kilometres wide, Folegandros’ size is nothing to boast about but it’s this very reason it’s often overlooked and is somewhat of a hidden gem of these islands. Folegandros has an air of exclusivity to it in the way that Oia in Santorini once would have before the cruise ships came in and the airport was built. The town, Chora, is quiet and authentically Greek but is equipped enough for the handful of tourists that visit that it’s not inaccessible. In contrast to the often touristic menus on the caldera in Santorini, restaurants in Folegandros feel family run and genuine. Food is served outside in courtyards underneath olive vines and there’s not a photo menu in site. The island is accessible via ferry which run infrequently throughout the week, and the little port, Karavostasis, is Folegandros’ second town. Nestled along this small cove are boutique hotels and little bakeries selling homemade produce. At night this little crescent offers the only glimpse of light along this part of the coast. Walk a little past the last hotel, along the beachwalk and you’re suddenly ecompassed by darkness, and then the sky is lit up with more stars than you’ll ever see. By day the beaches here are remote, yet rugged and beautiful. Folegandros is a photographers delight. Untouched and unspoilt even corner of the coastline offers another enchanting beach to explore. Make sure you watch the sunset from the Church of Panagia at the top of the hill in Chora. As you’ll be arriving by ferry the port is a good place to stay. There are limited ferries so the port tends to be sleepy and quiet but there are plenty of buses running to the town and it’s a good place to base yourself to get to the beaches. We stayed in Vrahos Boutique Hotel which was really lovely. If you’re after something a little livelier than look at staying in Chora where the restaurants are busier and there are a few bars in the evenings. Although don’t visit Folegandros for a bustling nightlife.